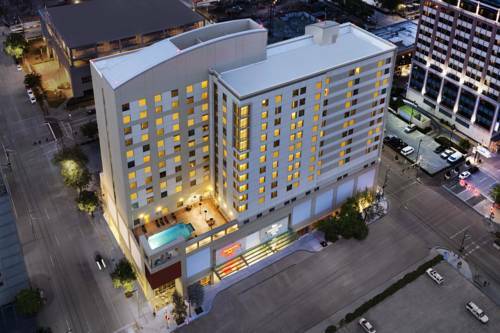 Stay in the middle of all the action at our Hampton Inn Houston Downtown hotel. From the minute you walk into our modern and stylish lobby you*ll feel right at home. This upscale high-rise building is in an excellent location to walk to attractions restaurants shopping and businesses. Just 30 minutes from both major Houston airports it*s easy to see why travelers choose our Hampton Inn for their Houston stay. Walk to the George R. Brown Convention Center Discovery Green urban park and Minute Maid Park home of the Houston Astros. Network with other business professionals at the convention center and in the downtown Houston Central Business District. After a day of exploring relax in a clean and fresh Hampton bed with free WiFi and your laptop on the lap desk. Start your day with free hot breakfast served daily featuring fresh-baked waffles hearty oatmeal with toppings and several other items. If you need to get to a meeting grab Hampton*s On the Run Breakfast Bags available Monday through Friday for a quick and healthy option. Choose a room on a higher floor for better views or a corner room with Discovery Green urban park views. Our corner rooms feature two queen beds with a sitting area perfect for your family or group stay.